I really did not intend on having a bachelorette party. Eddie and I are saving up for a home and I took a ton of days off last quarter taking care of my mom. As I told my dearest friends of my reasoning to not have a bachelorette party, they were having none of it. As they’ve already agreed to celebrate Eddie and me in the midst of a Chicago winter, I initially thought we’d try to head somewhere warm for a quick weekend. I really wanted my mom to join me since we’ve become incredibly close this past year. That meant flying was out of the question. The discomfort of hauling through the airport, the germs…it was too soon after her last treatment. Wouldn’t you know that my constant praise of Destination Kohler had my friends yearning for a girlfriends spa getaway to Wisconsin in February? 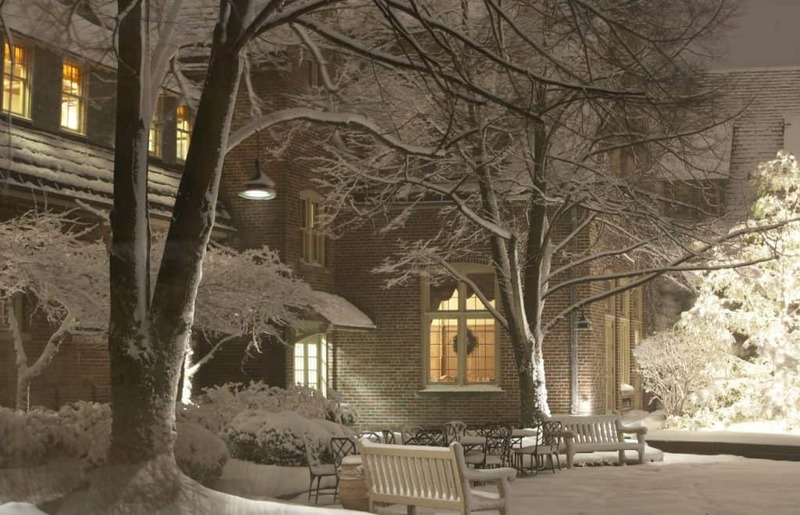 Pure Luxury in Wisconsin in the Snow Covered Courtyard of The American Club. Each year that I’ve visited Kohler, I’ve stayed at the American Club. This year, with eleven other women coming to enjoy a weekend away, I took advantage of Kohler’s brand new multi-room suites. Available as of January 2018, our stay six weeks after opening made it extra special. 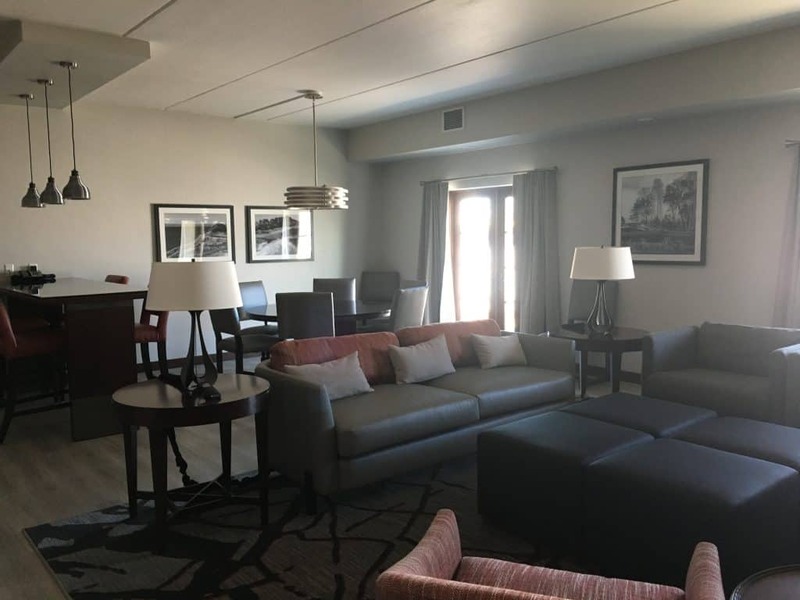 We rented out the Horizon Suite and one two-bedroom suite to accomodate everyone. Both rooms were modern and stunning. The gathering space of the Horizon Suite at the Inn on Woodlake. Before we stocked the kitchen with 12 bottles of wine and bubbly, 30 waters, 24 LaCroix, and so much snack food. 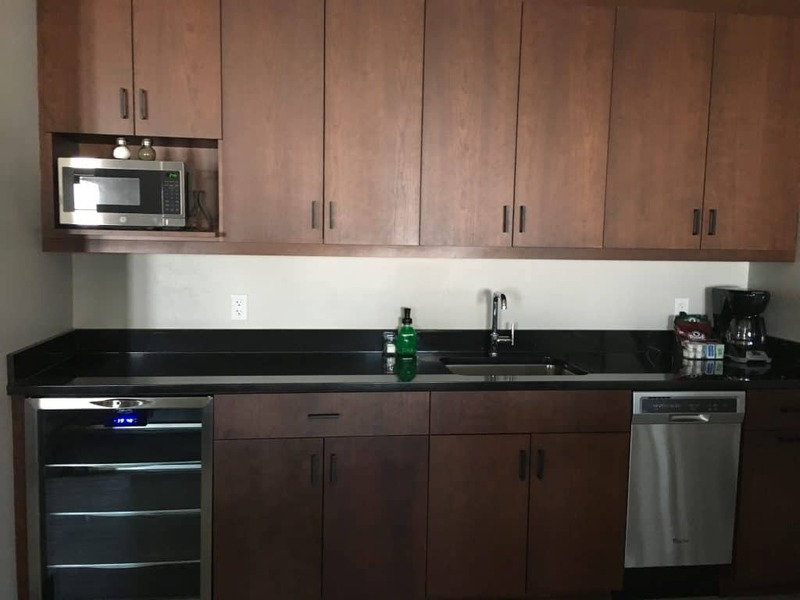 The half dishwasher allowed us to clean all the kitchenware that comes stocked with the suite. There are four identical bedrooms in the Horizon Suite. Each bedroom comes with its own bathroom. There are double sinks, lighted mirrors, and a Kohler designed triple head shower with additional overhead rain shower. In news that will surprise no one, the bathrooms were positively divine. 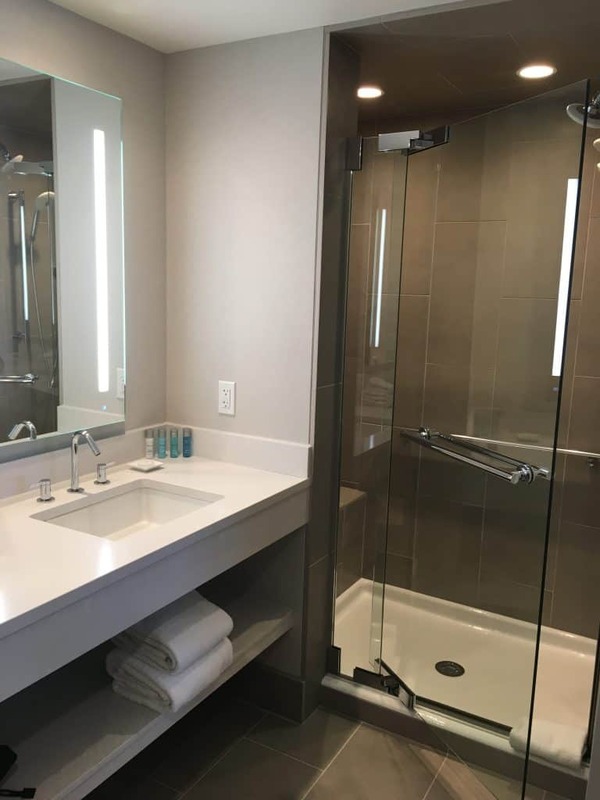 Four shower heads, overhead lighting and optional touch screen mirror lighting, hollyhock toiletries, dual sinks, and fluffy towels. It was a dream. The most flattering lighting in the bathrooms. Friday night was a little Northwestern reunion. Two of my besties from Chicago drove up together. On their way, they stopped in Milwaukee to pick up friends who flew in from New York. How humbling it is for friends to fly in for a girls getaway package to a tiny town of Wisconsin. When I say tiny, I mean it. While not very far from the city of Sheboygan, the permanent population of Kohler is just over 2,100 people. Twinkle lighting + Besties + Barrels of Wine + Bachelorette Party Pics = The best recipe! 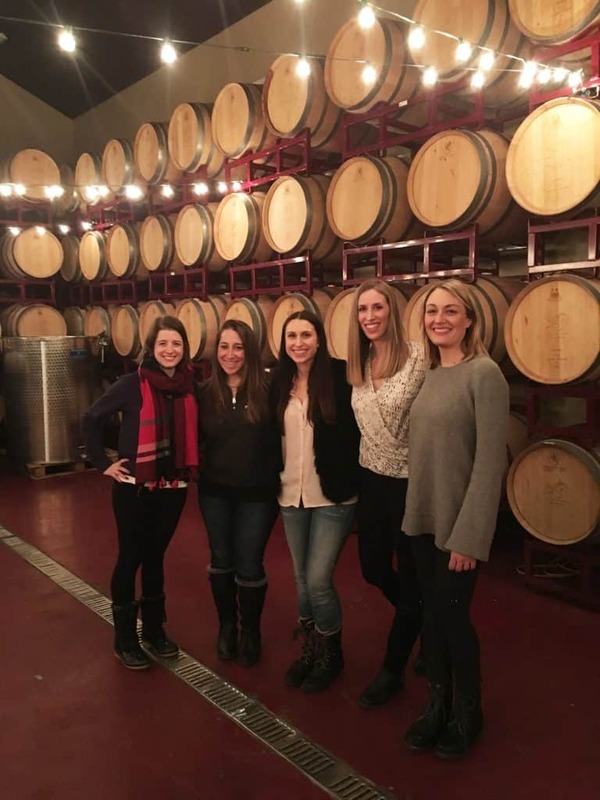 As a surprise, the girls planned for a private wine tasting and dinner at The Blind Horse Restaurant and Winery. Since Eddie doesn’t drink wine, we had never considered this restaurant in the past. 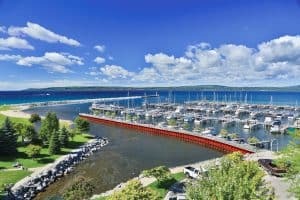 That’s also why he hasn’t joined me in some of my other trips, like when I visited the Petoskey Wine Region. Every Friday and Saturday, there is live music at the winery. After how pleasant our experience was this time, I’ll certainly be revisiting. Our tasting was in a private space at the winery. We tried five different wines made at The Blind Horse Winery. They were paired with fresh Wisconsin cheese and nuts. 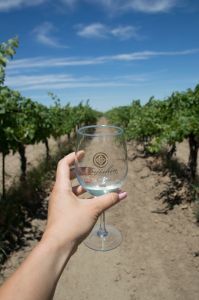 Personally, my favorite of the reds was the Vintners’ Blend Cabernet and for the whites, the Gewurztraminer. 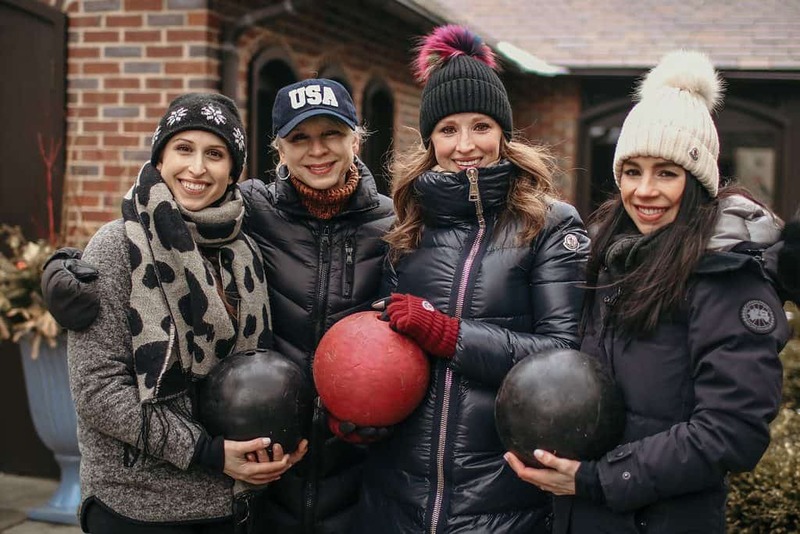 While not directly associated with the Destination Kohler property, this activity was suggested by the resort as part of our girls getaway package. Just like the Kohler properties, this winery exceed all my expectations. 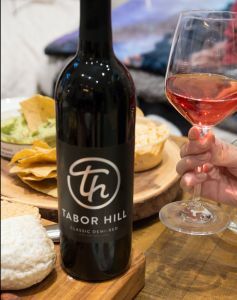 Wisconsin wines are delicious; who knew? 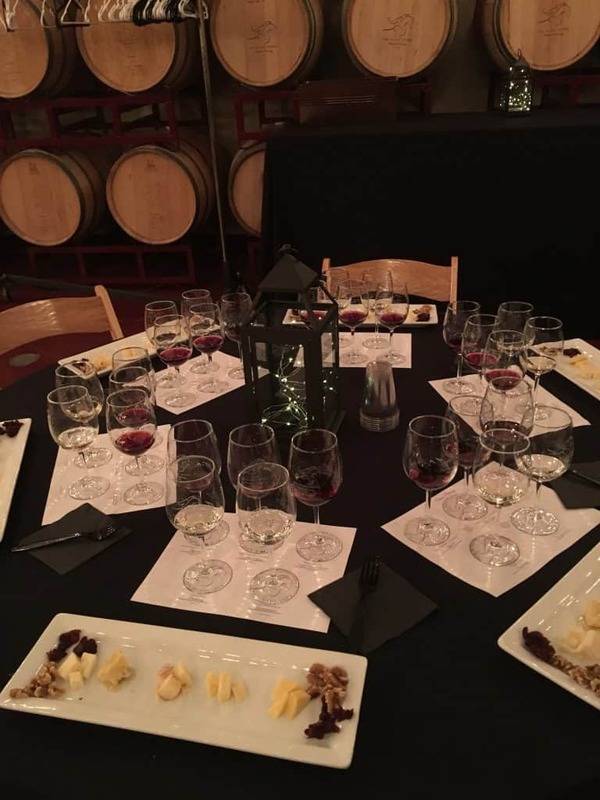 The delicious private wine and cheese tasting. P.S. Wisconsin wines are just as good as their cheeses! After our wine tasting, we exited the winery building to another building on the Blind Horse grounds. Here, we were escorted to a private room of a beautifully converted farmhouse to enjoy a fantastic dinner. Not only was the food divine, the service at the restaurant stood out as superb. Our server was genial, attentive, and accommodating to six somewhat inebriated women. He suggested fantastic food options and we tore through the entire small bites, bruschetta board, and appetizer portions of the menu. Enjoying the company of my dearest friends in a private dining room allowed us to get a little rowdy without disturbing other guests. As one of the later seatings, we were the last table at the restaurant and returned back to the comfort of the Horizon Suite to rest up for our day ahead. After a fantastic night’s sleep, we woke Saturday morning to the arrival of the rest of my friends. It didn’t hurt that a stay at the Inn on Woodlake includes a full spread of hot breakfast items in the atrium of the hotel. There were these little breakfast sandwiches that were to die for: egg, a bratwurst patty, spinach, and gooey wisconsin cheddar on a hot croissant. I could eat one every morning! 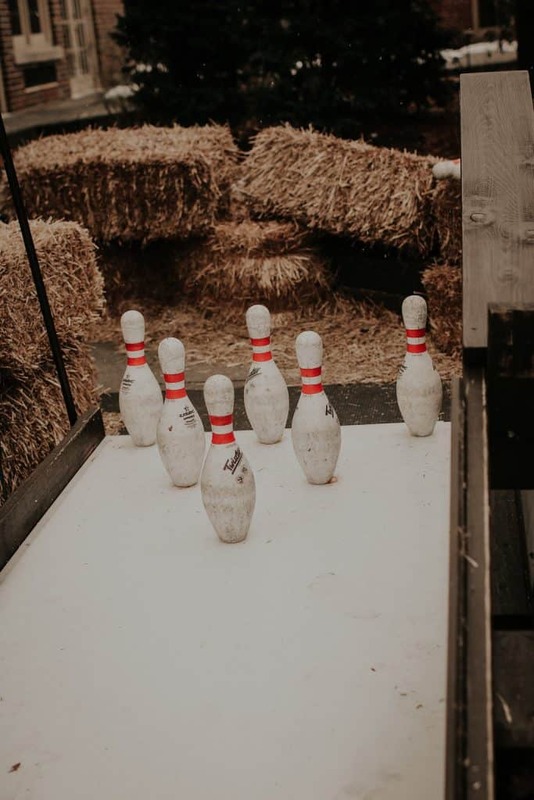 When I mentioned what I wanted in a Wisconsin bachelorette party, I kept it pretty close to my normal winter weekend routine. I wanted to do some yoga, some ice skating, play games, and drink wine. 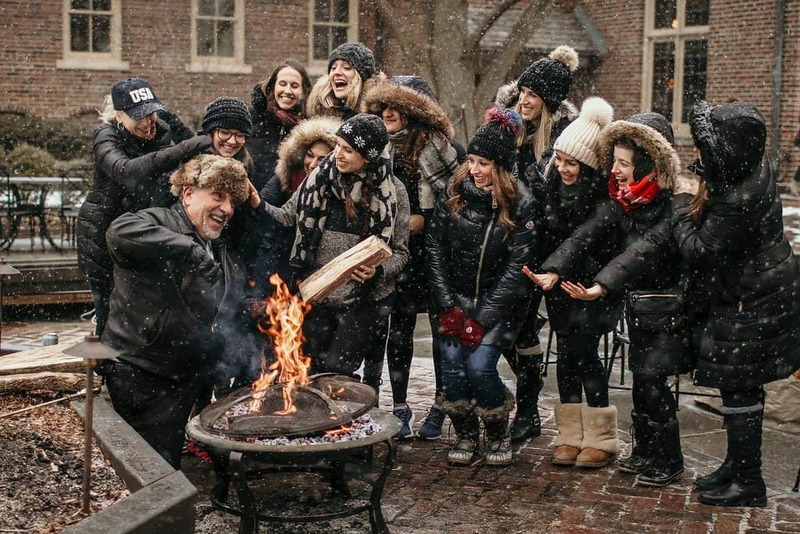 The girls getaway package also coincided with Kohler’s annual “Celebration of Chocolate” weekend. Upon check-in, we received a box of Kohler chocolates and bottles of wine. 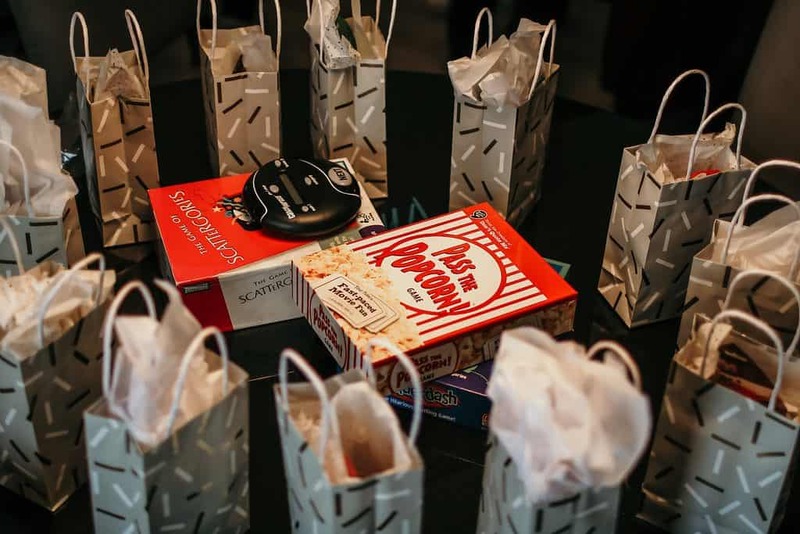 We also received tickets to the “Sugar High” event, an evening of food, chocolates, wine, and live music at the Kohler Design Center. We started the day with yoga at Yoga on the Lake. With an entire wall of windows looking out onto Woodlake, the floors of the studio are heated to make sure students stay warm. In 2017, a hot yoga studio was added as well, but we chose to take a standard yoga class. Although advertised as multilevel, it was an incredibly difficult class and we all worked up a sweat. 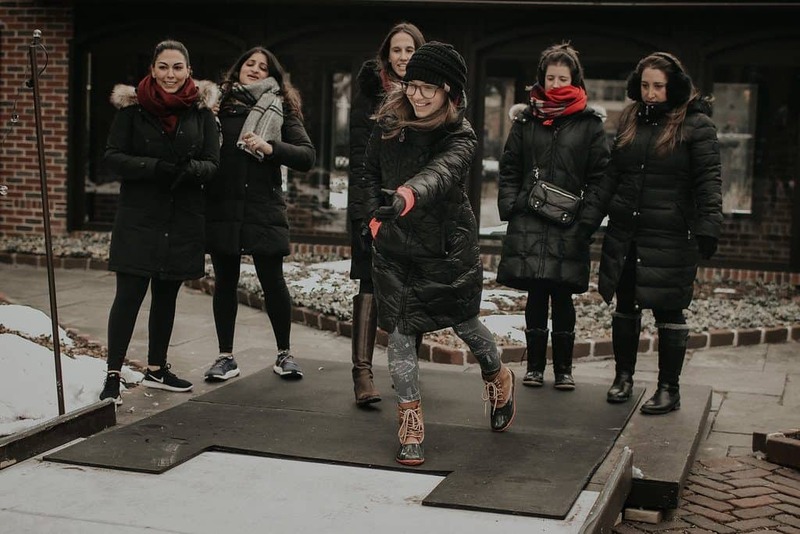 After yoga, the girls getaway package migrated from the yoga studio to my favorite winter activity: ice skating. Only three friends were brave enough to skate on the frozen lake. We had a great time, and everyone skated really well. Ice skating is a little like riding a bike; if you’ve never done it, you can’t just start. If you’ve done it before, it comes back to you easily. My mom and I brought our own skates, but the Inn on Woodlake loans out skates to anyone staying at a Kohler property. 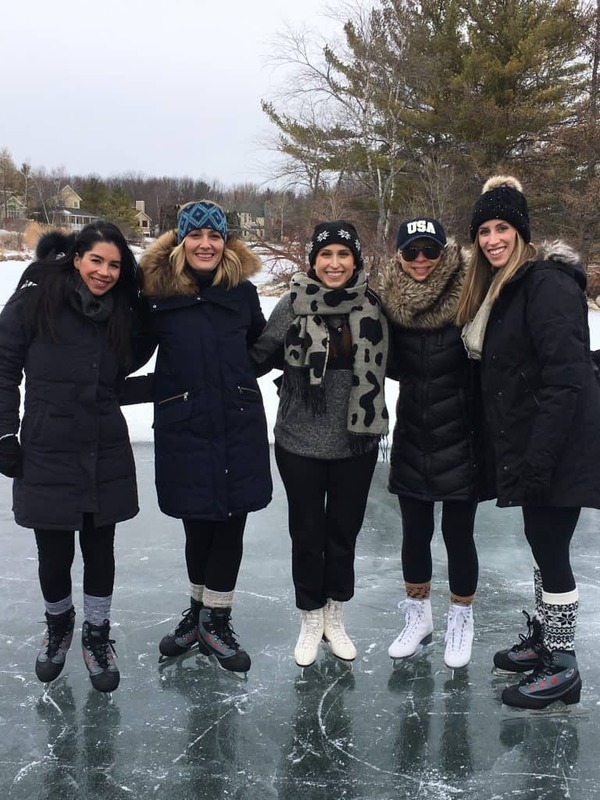 For those who skate at the holiday rinks around town, skating on a frozen pond is a completely different experience. First, you are not competing with crowds. We were the only ones on the pond for a full hour. That means if you can’t stop, it isn’t a problem because there is no one with whom to collide. Secondly, there is no outer railing you can use to hold yourself up. As such, you need to have a basic ability to stay up and move forward. Finally, although the lake is pretty smooth, you may run into some bumpy patches. Luckily, we managed to avoid the bumps and ended up really enjoying our time out on the lake. 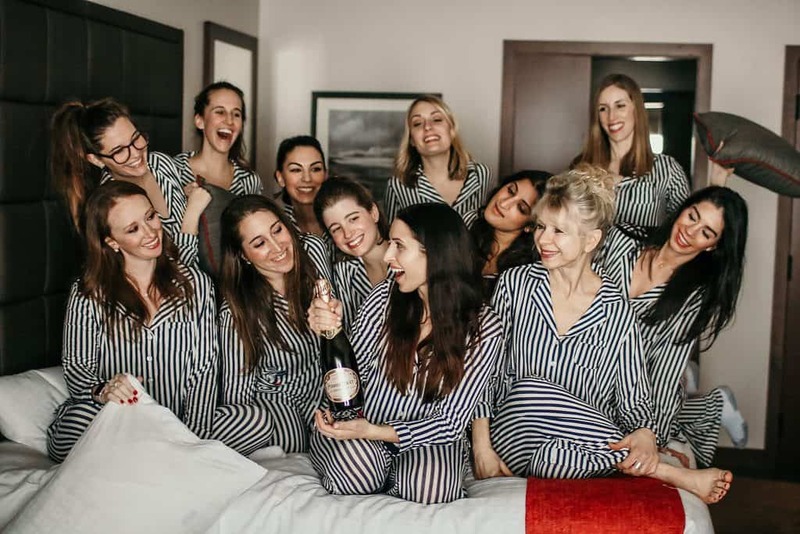 Did this Girls Getaway Package Come with a Photoshoot Party? The women in my life are so special to me. They’ve gone on long walks with me when I am too anxious to sit still, they’ve hand fed me when I’m too ill to move, and they always make me laugh when I’m sad. The last thing I wanted was to have just one photo of all of us as we rotated to have one girl jump out to take a picture. So, I went searching for a photographer to take bachelorette party pics. I discovered Joanna when I was searching for Kohler and Milwaukee area photographers. I loved how full of emotion her work was so when she was available for the photoshoot party of this girls getaway, I was thrilled. I’m so pleased with how the bachelorette party pics came out. Moreover, my friends treated my mom and me to such an incredible weekend of love. I’m not going to reveal everything about the weekend, but the girls getaway package included a visit to the Kohler Design Center, a custom cake, and a wall of macarons. Joanna did such a great job and if you are in the Milwaukee area, I highly recommend reaching out to her. 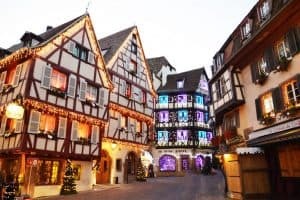 I was incredibly happy to have my friends experience a place so dear to me. I think they enjoyed the photoshoot party aspect of it as now they have as many bachelorette party pics as they can handle. 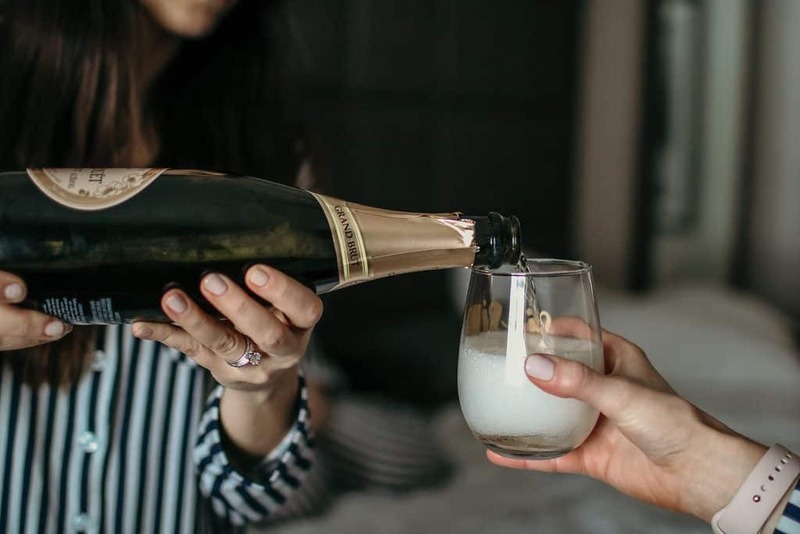 For anyone looking for Wisconsin bachelorette party ideas, I highly recommend a girls getaway package in Kohler, Wisconsin. Oh my goodness the matching PJs are to die for. And I love the pictures! What camera did you use!? I hired a professional photographer. She used Canon products. Those PJs though! I’m planning a friend’s bachelorette now so I love reading this. So many great ideas! Every single one of them looks like sooo much fun! 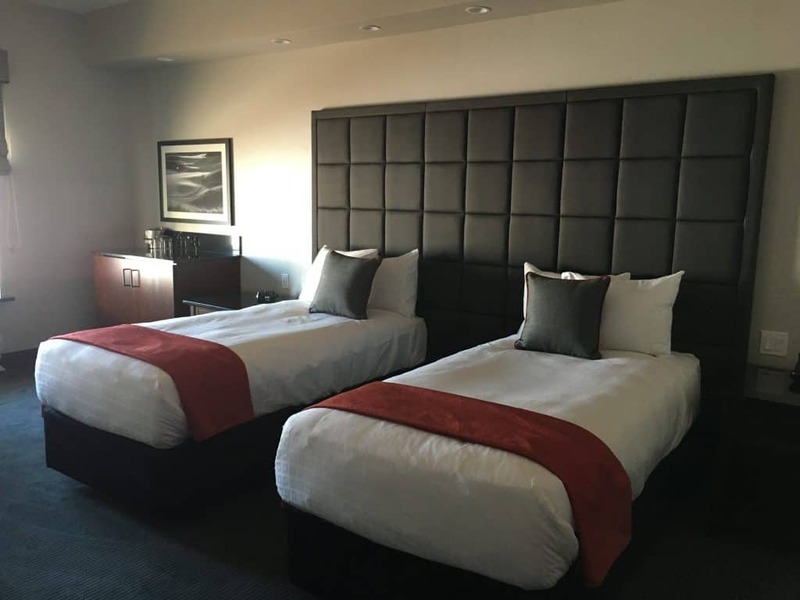 You booked a beautiful suite and it looks like you had a great time wine tasting etc. for your bachelorette party. 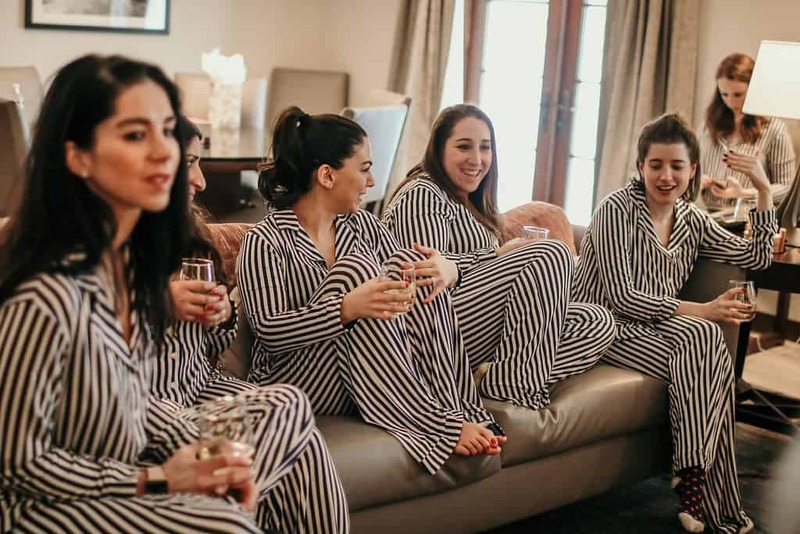 The matching striped pajamas are great. Best wishes. The picture with same outfit is absolutely adorable… I love it. The bathroom does sound divine. That’s actually the first thing I check in a hotel room. You are making me long for a girls trip. It does feel wonderful when friends fly in to meet you. Looks like you guys had tons of fun! 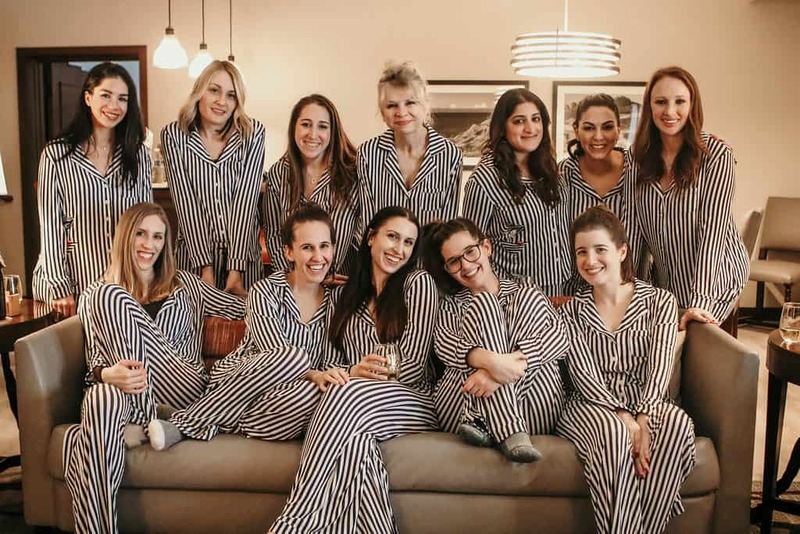 I love seeing ideas for “alternative” bachelorette parties and getting a professional photo is such a fantastic idea. 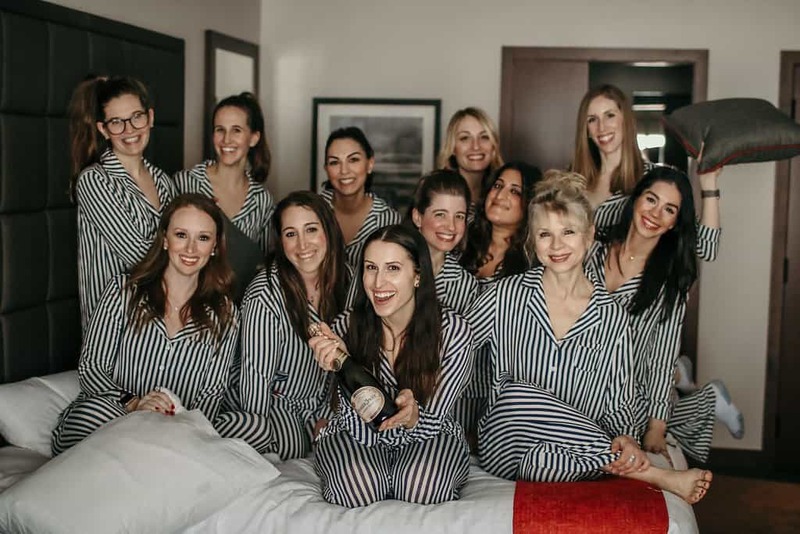 What a great idea to hire a photographer for the bachelorette weekend! I’m glad you enjoyed yourself. And the pjs are super cute! This looks like SUCH a fun weekend! Who knew there was so much to do so close to home?! I love the idea of the photoshoot and the wine tasting. I wish I’d thought of those for my bachelorette! This is seriously the cutest thing ever! 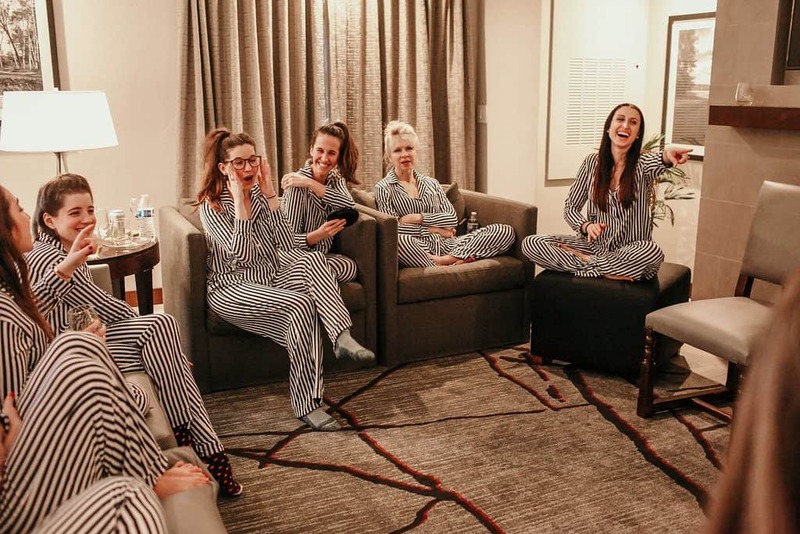 Especially loved that first shot of y’all in matching PJ sets and I mean, girls night out with wine tasting and dinner is never a bad idea. It’s so sweet that you brought your mom along too. Idk why but usually when I think of bachelor/bachelorette parties, I think of Vegas. It’s nice that you didn’t celebrate the mainstream way and just relaxed and had fun with your loved ones rather than spending time puking up booze in a bathroom hahaa. I pretty much love everything about this! From the wine tasting to the PJs to the photoshoot – it’s all so cosy and adorable. Dibs on the next girlfriend getaway, haha! Looks like a good idea to have changed your mind to have a b-party! The yoga class by the lake and the wine tasting would have been my favourite! I love how it looks in the snow, magical. Wisconsin looks like a fantastic ‘off-the-beaten-track’ destination for a bachelorette and I love that. I love the matching PJ’s makes for a great photo. Kohler’ multi room suites sound like the perfect way to enjoy a girls vacay! The Horizon Suite looks like it has a tone of space. 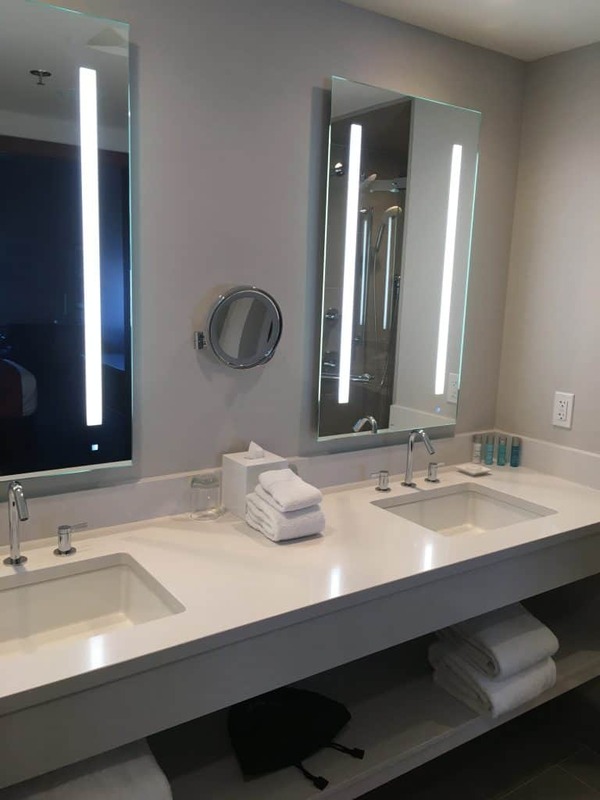 Love the bathrooms too and the double vanities – especially important when you’re with 12 girls and everyone wants to get ready for the night out.Wine tasting, yoga and iceskating sound like a great weekend away, so glad you enjoyed your bachelorette – love, love, loving the matching pjs! And congrats on the upcoming wedding! 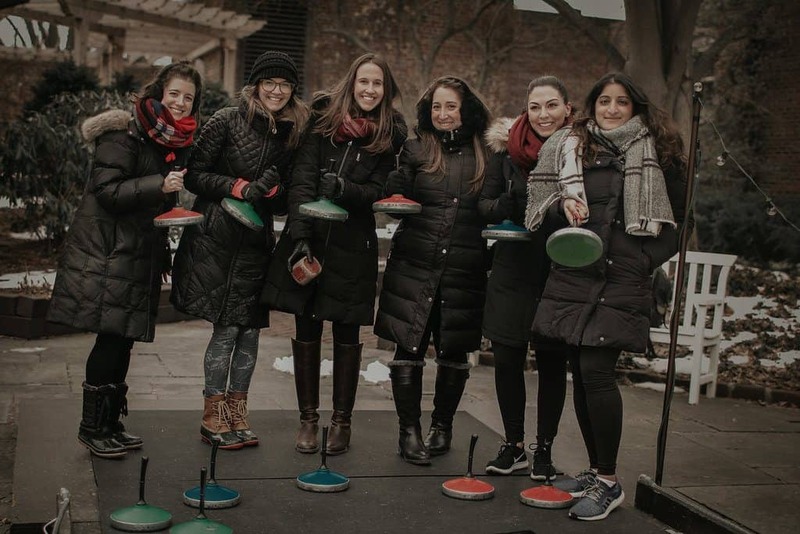 Absolutely beautiful photos – looks like you girls had so much fun! 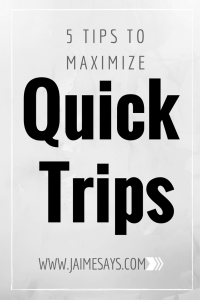 Fantastic ideas for a bachelorette party!